Please click on "Contact Owner" and connect with me directly for the best prices and quote by sending your dates. We invoice via PayPal and you can pay by credit card. 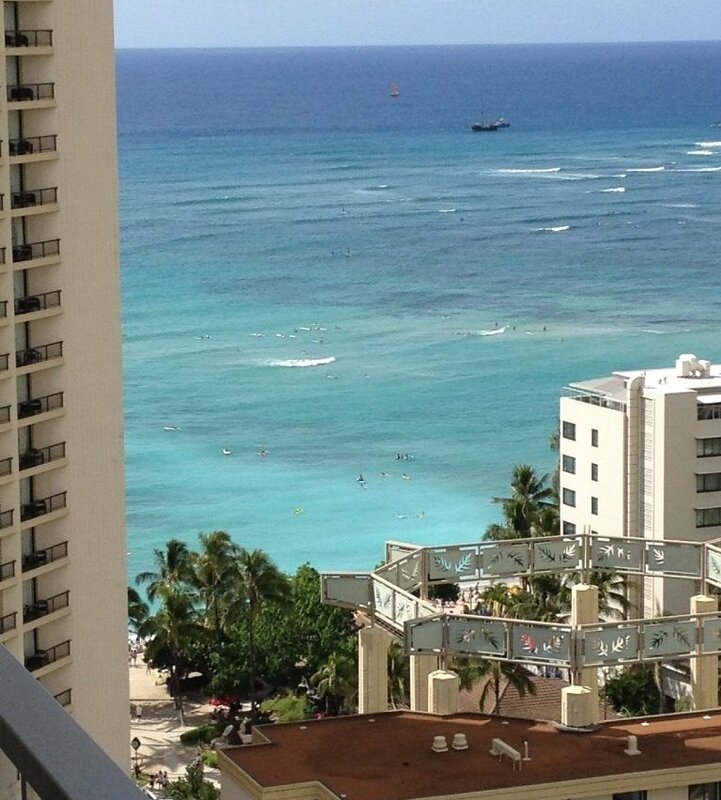 Enjoy spectacular ocean views of Waikiki Beach from your lanai, high floor, plus mountain and city views. 700 ft. to beach. (Dukes Statue). 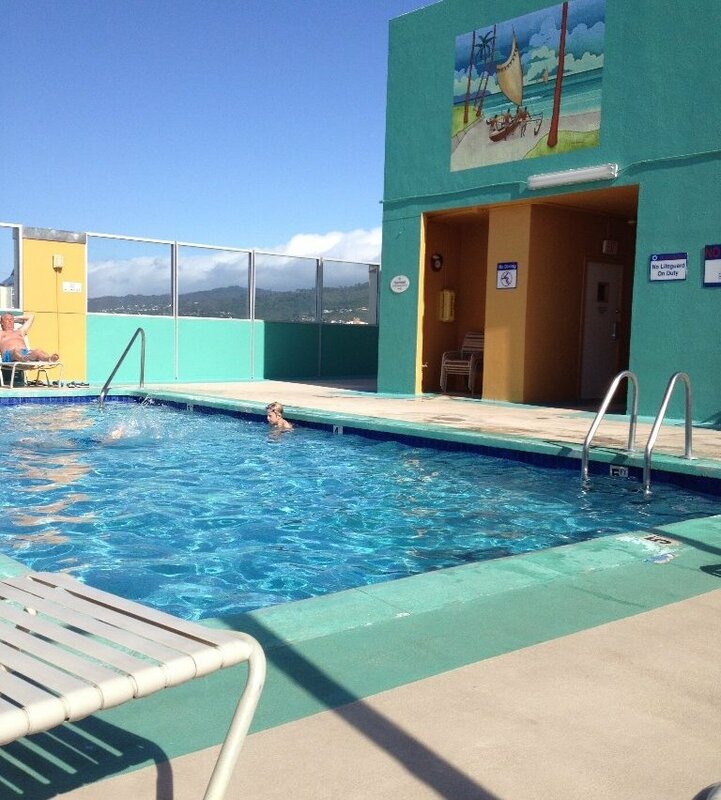 Rooftop pool & hot tub, and a sauna that overlooks Diamond Head. Watch Western Sunsets, Rainbows or Fireworks from your wall to wall lanai. Free hi speed WIFI, full sized fridge, kitchenette, beach chairs & in room phone for free local calls / messages & free inbound local calls Save $. 39' SMART TV/Blu Ray & DVD player. 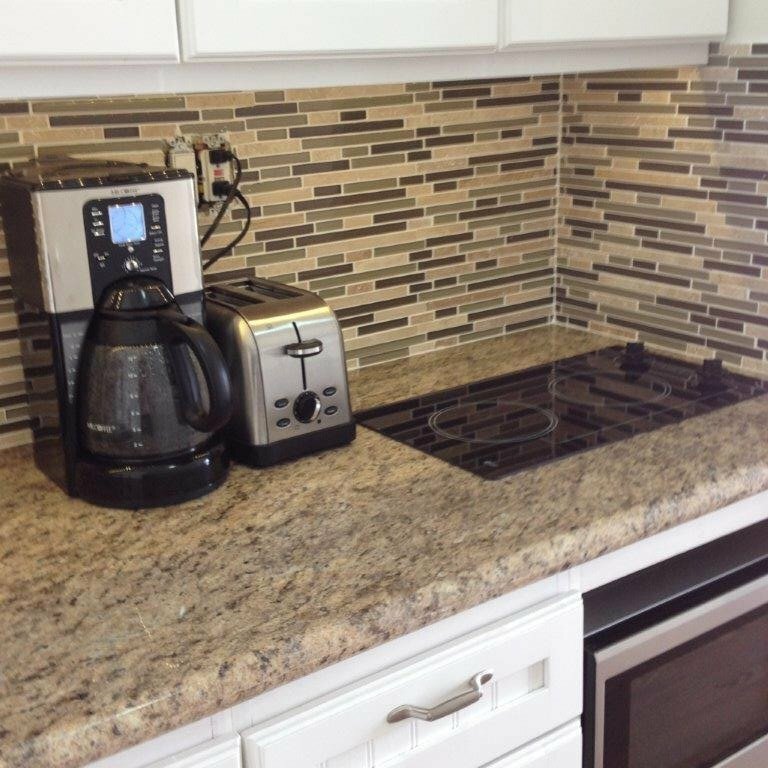 All furnishings new, granite counter tops, stainless appliances, custom cabinets, and tastefully remodeled. Close to everything, no need to rent a car. 700 feet to beach (Dukes Statue). Cafe and authentic Japanese restaurant on main floor. On-site property manager. 24 hour front desk & security. No need to worry if your flight is delayed. 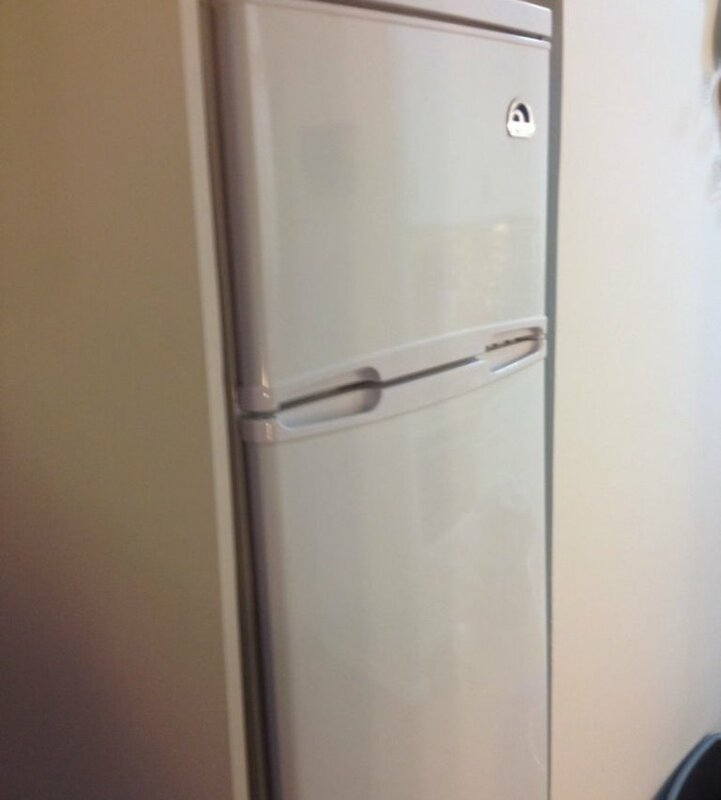 * Kitchenette, with microwave/convection oven, 2 built in burners, coffee maker, blender, rice cooker, crock pot, full size refrigerator, toaster, all dishes etc. 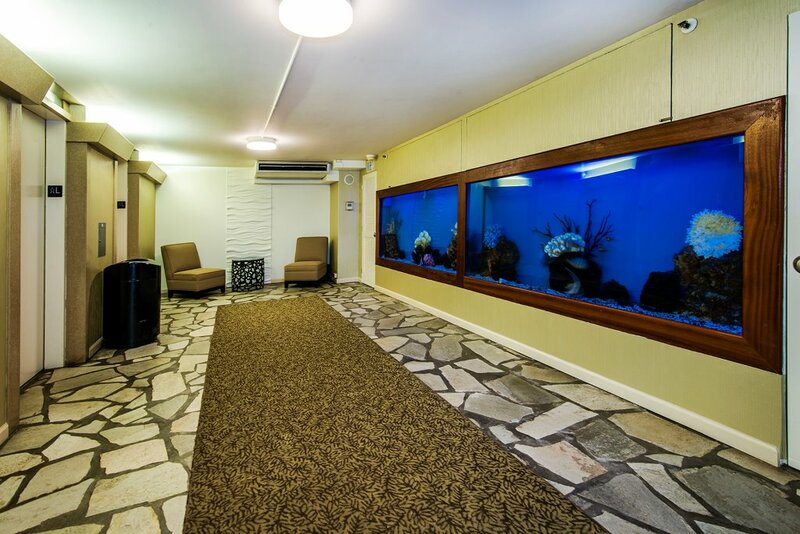 * Nightly secured garage parking attached to building $30pd (but may be able to get special rate for monthly stays at $20 pn) - No car really needed, other parking available in area - Rent a car from Enterprise or Alamo right behind our building. Opens at 7:00 a.m. and drop car off by 8:00 p.m. Do a tour of the island and save on any parking costs. Parking is attached to the building (hourly or daily parking $30 per day). We normally just rent a car from Alamo right behind our building for the day(s) we want to tour the island and avoid the parking costs. 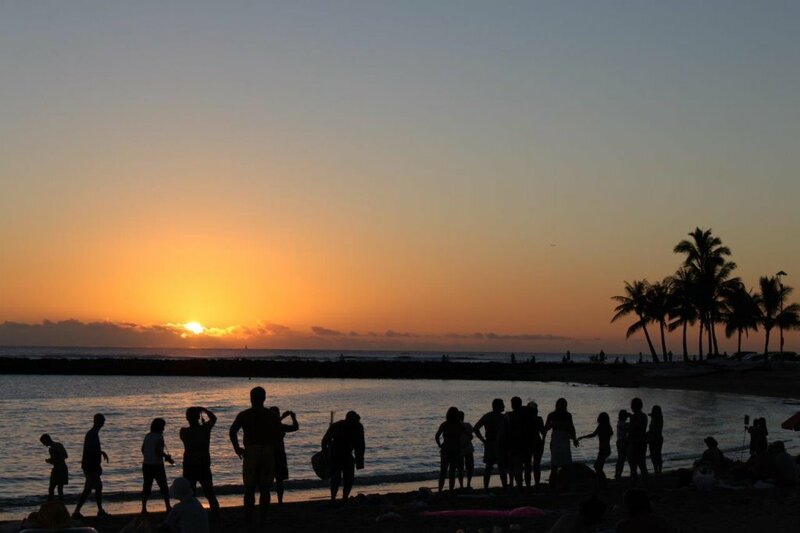 They open at 7:00 a.m and you can drop off the car by 8:00 p.m. Everything is within walking distance 15 minutes either way to enjoy all Waikiki has to offer. Will send you the invoice - just send your address with dates of your stay and I will prepare the invoice and send you a Welcome Letter. If you cancel at least 30 days prior to the arrival date and another renter is not found for the cancelled period only 50% of your investment will be refunded. 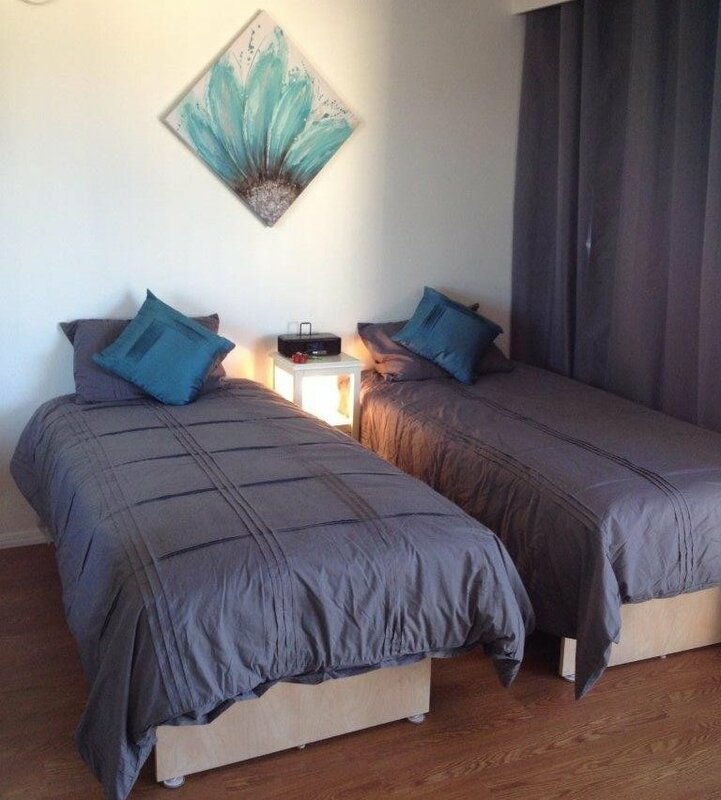 We make every effort to re-rent the unit, however; we’re sorry but cancellations made within 30 days of the arrival date may result in a forfeiture of your investment. 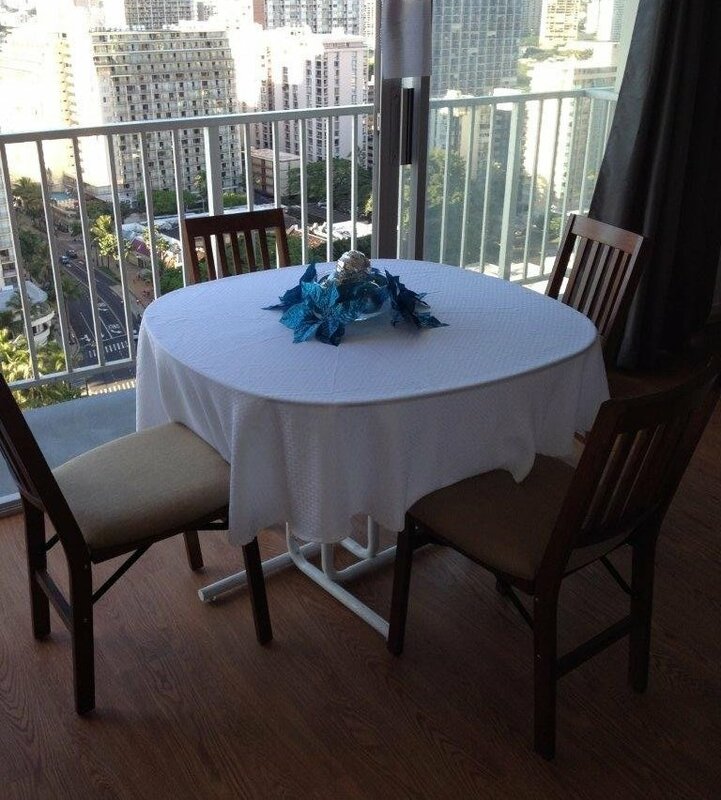 Waikiki Condo, Studio, Ocean Views, Waikiki, Condo, WIFI, Beach, sleeps 4, high floor, western sunset. 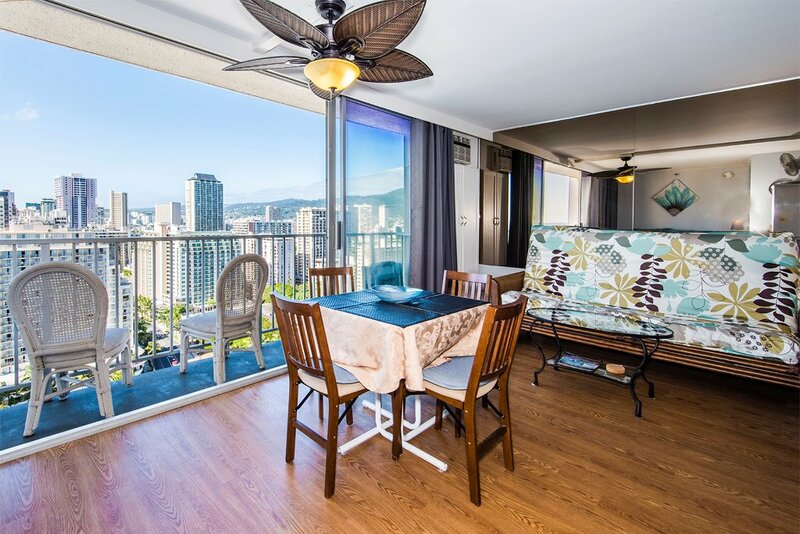 One of the best deals for location and amenities in Waikiki. Take the 1st right onto S Beretania St.
Take the 1st left onto Kalakaua Ave. 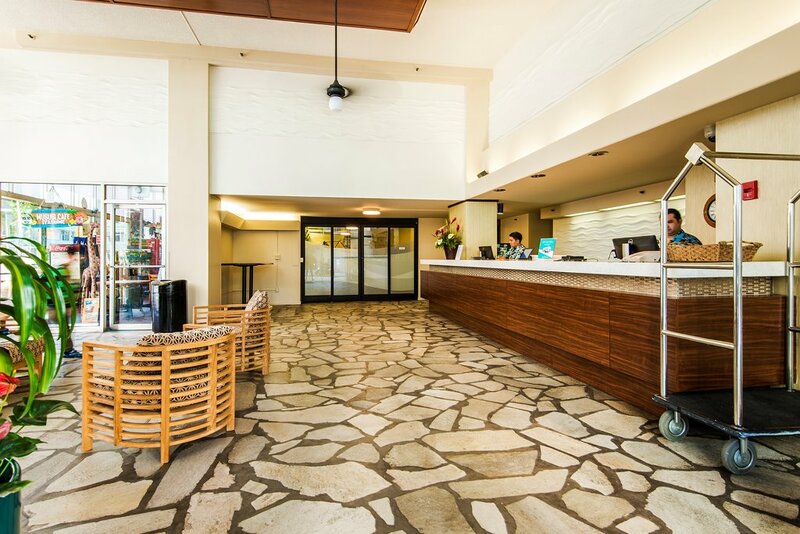 Turn slight left onto Kuhio Ave.
Security Deposit: 25% deposit to make booking. If you would like to book click on "contact owner" and send us an email to get the best rates. We don't charge a service fee or the $20 per day resort fee (all is included). We will need your dates, postal address and phone number to prepare a PayPal invoice. We will email you a Welcome Letter and a copy of the invoice directly by email for the deposit. 30 days prior we will send you another PayPal invoice for the balance. Upon final payment send you all the entry information. 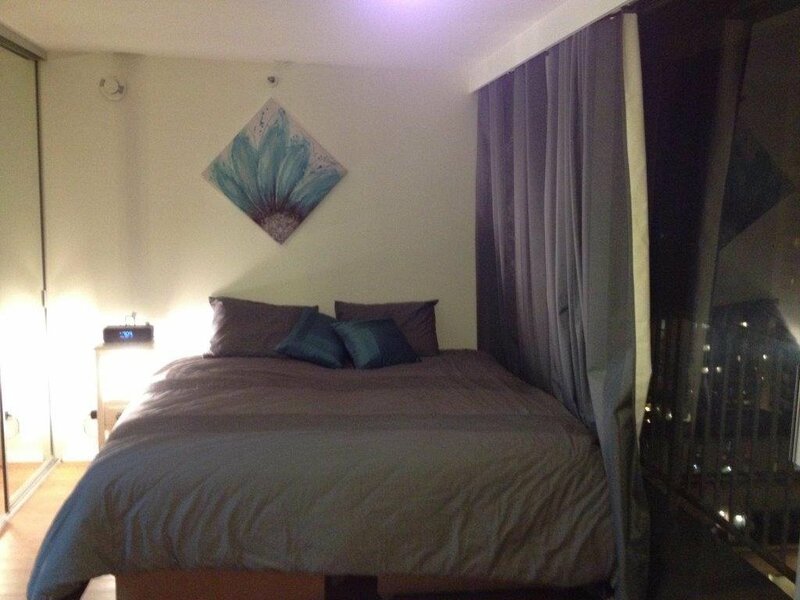 We've rented our units since 2008 and have 5 star ratings on other sites. If you would like to book, please click on "Contact Owner" to confirm your dates or if you have any questions. We like to speak by email or phone with each guest to ensure your stay is the best it can be. 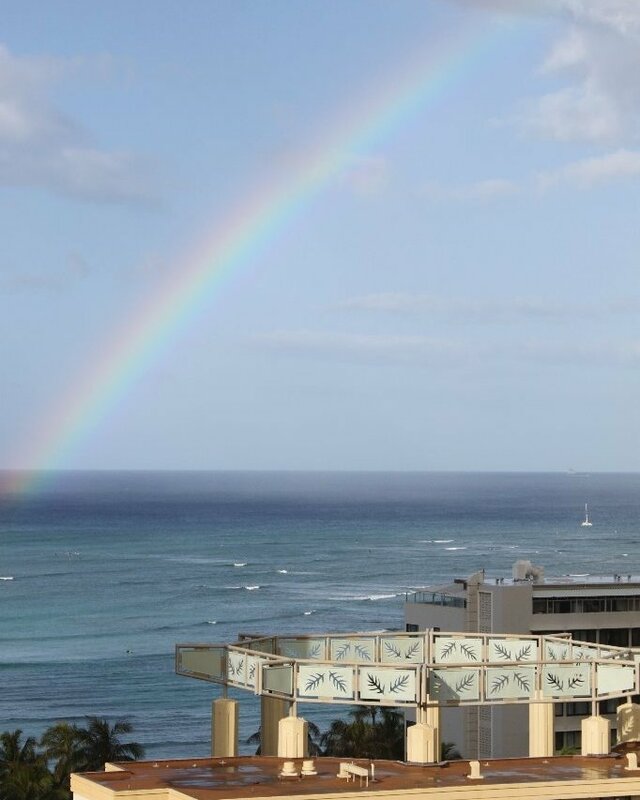 The suite has FREE Wireless Internet, and Western facing, sunset ocean views (plus city and mountain views - you can watch the surfers, sunsets, fireworks and rainbows from the lanai. Plus it has an in room phone with free local calls and free inbound long distance with voice mail. (saving $$$ on communications). 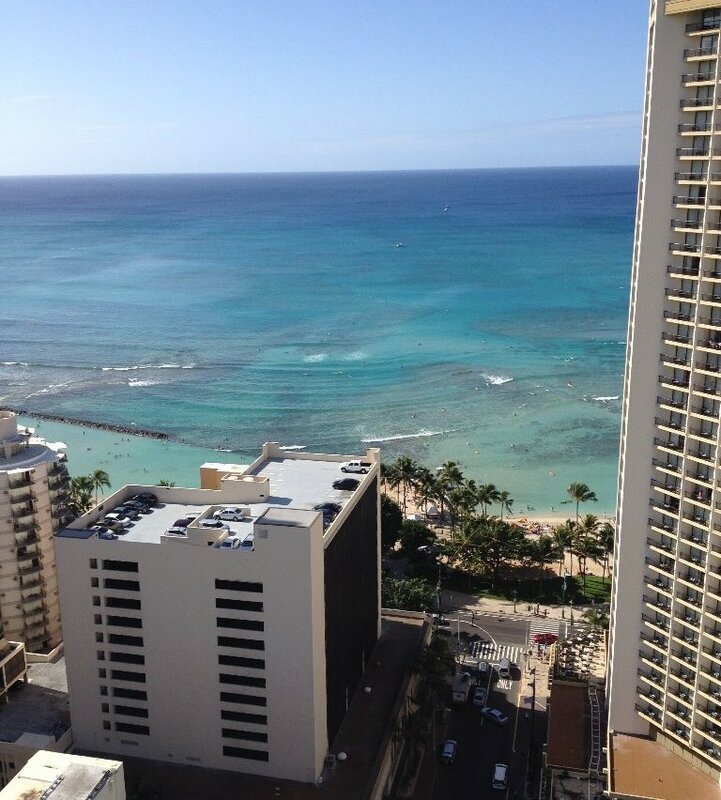 The beach is just 700 feet to the best part of Waikiki Beach (Dukes Statue). International market is 1.5 blocks away. 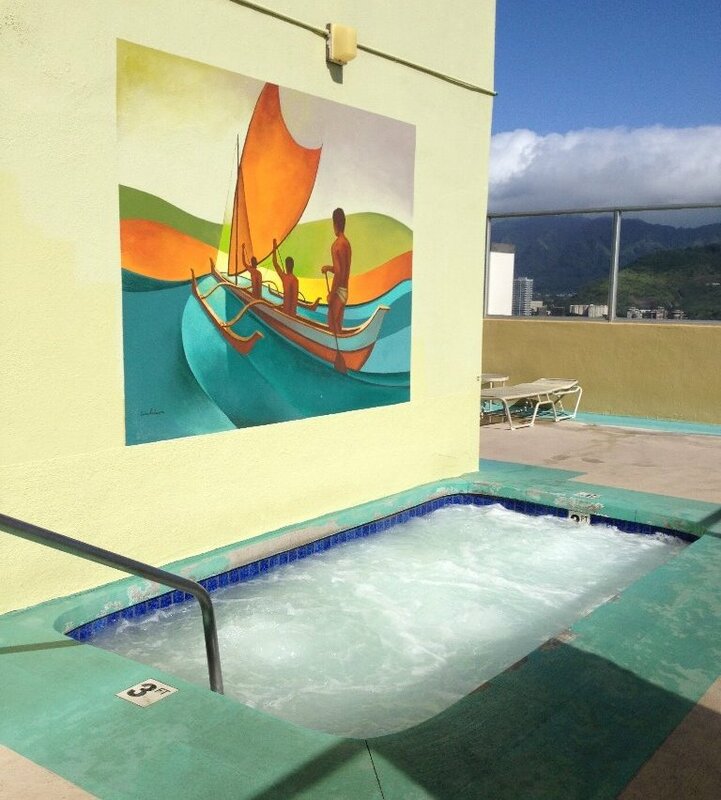 Very central and newly renovated building with spectacular views from the rooftop pool and hot tub. We have an on-site property manager to assist you should you need anything during your stay and there is a 24 hour front desk and security. Will be sent to guest at time of booking. $250 damage deposit. 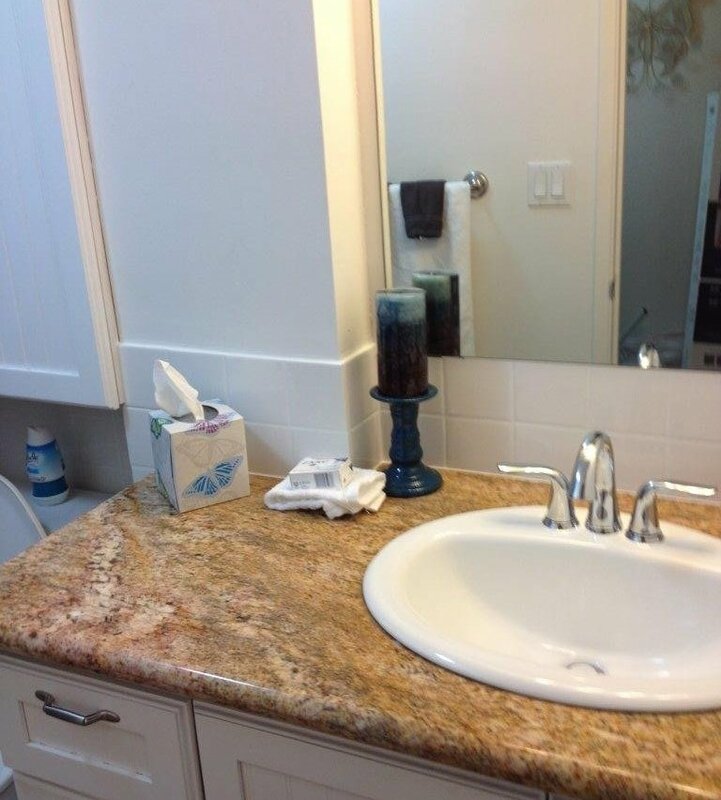 The condo is well-appointed and in a great location! I was a little nervous and afraid that all might not be as expected, but from the booking, to location, to check-out , everything was smooth and hassle free! The pool and hot tub on the roof were enjoyed upon a number of evenings during sunset, and the view is nice. Yeah, there are a few high rises that prevent a full 360, but if you want to have that view, be prepared to pay 4X's the price! The location is, as stated, just steps from the Duke Statue. We scheduled a food delivery from Safeway and took advantage of the crock pot to prepare a number of meals during our stay. There are currently 2 Tommy Bahama Mama backpack chairs in the unit that we used on the beach throughout our stay. There are also 2 camping chairs, in chair sleeves, in the condo if need be. We really enjoyed going out to Tiki's Grill and Bar, it's just down the road and they have live music every night, good drink specials, and tasty food. I highly recommend the lettuce wraps, made with prime rib and lots of veggies goodness! If you want to hike Diamond Head, just take the bus. As we were naive', we opted for a taxi, and paid WAY too much to get there! Hop on the bus, it's a short ride. If you use Google Maps, it will inform you of the next pick up time as well as the bus # and route. We taxied there and walked back. It is a decent, safe walk. If you walk, stop by the Ban'an truck on the right hand side. They serve yummy ice cream like goodness minus the dairy and added sugar, it is not even nut, but banana based! The actual Waikiki Beach is rather crowded, although we enjoyed the time we lounged, if you want to get in the water, I suggest you walk a few blocks to Kuhio (?) Beach and either get in in the area protected by the wall, (nice soft sand in the whole area) or sit and watch the waves crash by the shore, as the area in front of the volley nets have much more reef and rock at the shoreline, so we did not enjoy the water experience as much as the wall side. 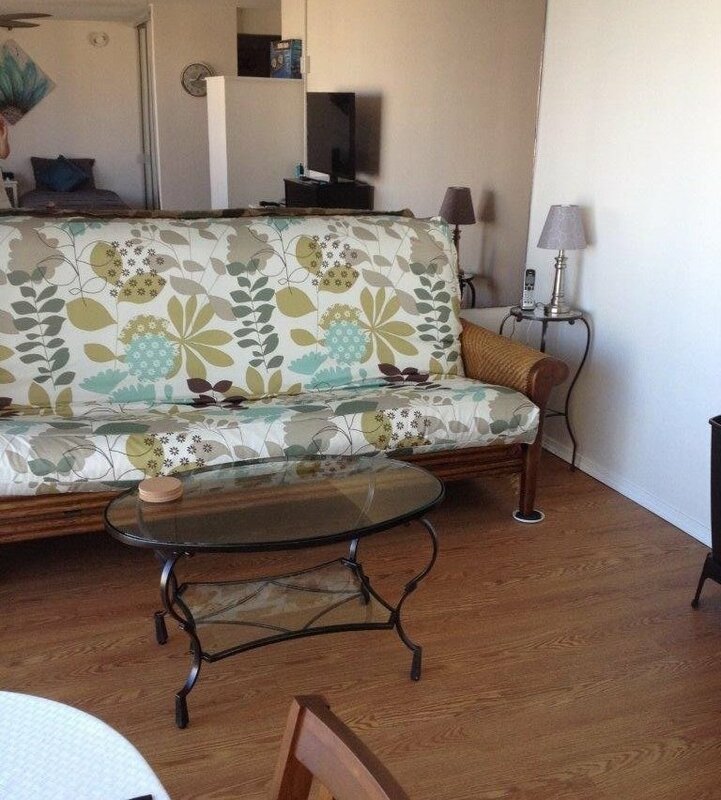 Overall, this condo is in a great location, with ample, yet not fancy accommodations. 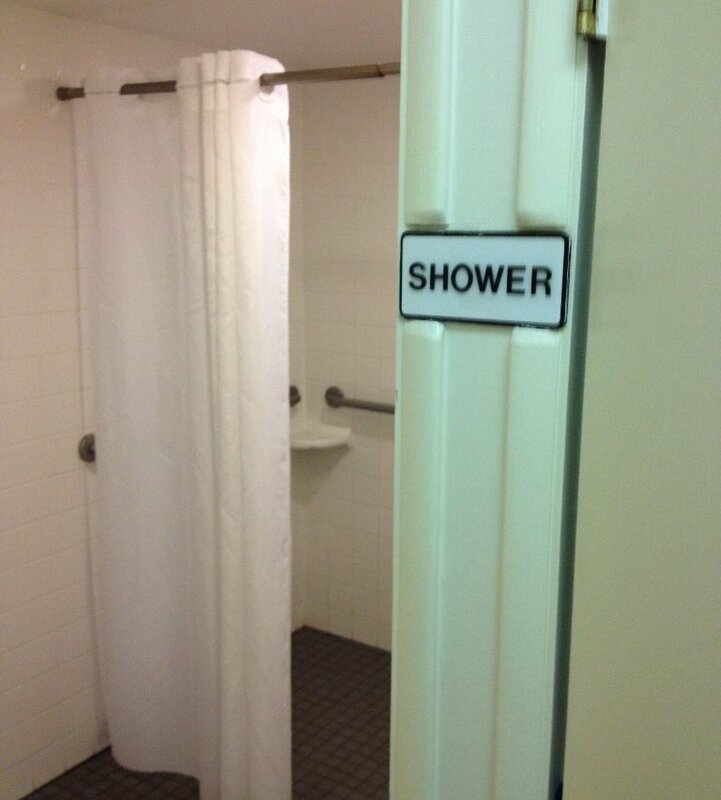 If you want an ocean view that includes a kitchenette in a great convenient location, that has all of the amenities of a nice hotel, this is the spot for you! We would readily book again if we were vacationing in Ohau! Thanks so much for your great review. We try to ensure things are the way our family would like them also. Look forward to having you back. Check in process was a breeze as well as checkout, this was the first time I rented a condo vs hotel for vacations and Elaine was very attentive to addressing questions I had. Very close to the beach. The Condo was clean and well decorated. Kitchen area looked new, lots of plates/utensils, there are also beach chairs and other amenities that will be good for your trip. We had three adults and an 8 month old, space was plenty for all of us. Partial beach views from the balcony, AC unit kept the room cool and there is high speed internet/cable TV w/DVR so you can be out all day and come back and watch your sports at night (cant miss the NBA playoffs!). I would recommend this over the hotels that charge 2/3x as much nearby. Thank you Asib for your great review. We look forward to having you back again.